High Strength Without Heat Treatment! An option to 319, 355, and 356 heat treated aluminum sand castings is the Tenzaloy, or 713 as-cast aluminum alloy that we pour in our aluminum sand foundry. Physical properties are equivalent to the heat treated 300 series aluminum alloys with minimum results of 32,000 psi tensile, 22,000 psi yield strength and 3.0% elongation. These properties are attained through the natural aging process at room temperature over a 2-3 week period. This increasing strength nearly levels out in the aluminum sand castings after the 3 weeks, increasing only slightly for up to 6 months further to its peak stability. Beyond the obvious cost savings of heat treat process and lead time improvement, a self aging aluminum sand casting in Tenzaloy 713 alloy is not subjected to the warpage concerns on heat treated castings. To accelerate full properties, rather than allowing the natural aging process to run its course, Tenzaloy 713 can be artificially aged to T5 condition. Our aluminum sand foundry can offer these T5 heat treatment services for our Tenzaloy 713 aluminum alloy castings through our affiliate Alcast Company. The machinability of the Tenzaloy 713 aluminum alloy is comparable to 500 Series aluminum-magnesium alloys and superior to the heat treated 300 Series aluminum-silicon alloys. 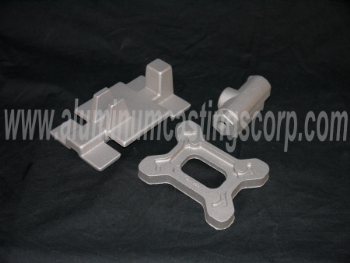 Full machining services are offered through our affiliate Alcast Company. Tenzaloy 713 is also very acceptant to the anodizing process as well as polishing to a high luster. With comparable corrosion resistance to most 300 Series aluminum alloys, Tenzaloy 713 is a viable choice for frames, levers and brackets where impact strength or load bearing is required in the aluminum sand casting.